An exquisite preparation by the Quraishi family in Delhi, passed down generations. Defrost (do not cook) in microwave for 5-8 minutes and eat immediately. Can also pan/air fried or grilled. Home Made Malai and Tender Mutton!. Halal Cut. Set microwave oven on defrost mode. Place frozen Seekh Kebabs upright along the edges of a bowl. Defrost for 5-8 minutes or until hot. Heat a little oil in the frying pan and place the thawed Seekh Kebabs in it. 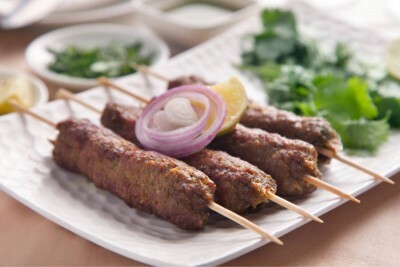 Cook the Kebabs by turning, till surface colour is slightly brown. Air fryer can be used for 5-8 minutes at 160 degree temperature settings. Flip the sides after 3-4 minutes.